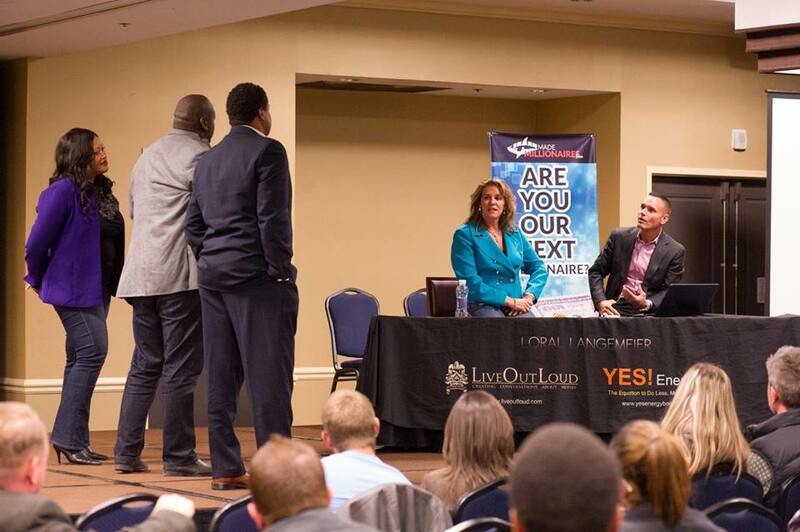 NEW YORK, New York – Loral Langemeier, today’s pioneering money expert as well as founder and CEO of Live Out Loud, Inc. is on an international tour with goals of sharing how to create a sustainable business in any economy and creating new millionaires along the way. These two stops of Loral’s tour will be in New Jersey on Thursday, July 17 at 9:00 a.m. local time, and in New York City on Thursday, July 17 at 6:00 p.m. Both events are free of charge. Click here for more information on the July 17 event in New Jersey. Click here for more information on the July 17 event in New York. Loral and Kevin have teamed up before to speak at live wealth-building events, much to the delight of the attending crowds. Loral & Kevin speaking at an event in Austin in February 2014. Loral’s proven curriculum will reveal how entrepreneurs can stay one step ahead of the competition and what strategies they need to make money. She will reveal how people already have the tools needed to achieve sustained success. Kevin will teach those in attendance how to market their ideas to the masses, master direct-selling techniques, and land investors to support their business ventures. To secure a media pass to either of these events or if you have further questions, please contact Online Marketing Coordinator Juan López at Juan@LiveOutLoud.com. Loral Langemeier is living proof that it makes no difference where you start in life; anyone can have the life of his or her dreams. Growing up on her family’s farm in Nebraska, Loral learned the value of hard work, persistence and how to get things done even in the face of much opposition and criticism. Loral began her career working for the Chevron Corporation right out of college. It was clear to her early on that there was more to life than cubicles and trading her time for dollars. Despite her own fears and persuasion from friends and family against it, Loral quit her job at Chevron to become an Executive Coach. Not only is Loral a business developer, she is also a key thought leader in the entrepreneurial space. As a single mother of two children, she is redefining the possibility for women to “have it all” and raise their children in an entrepreneurial and financially literate environment. For more information, visit https://www.LoralLangemeier.com.